Shopping wasn't only about the product. The experience mattered, too. Shopping, like other activities in culture, has a history, which means it is subject to nostalgia. We may know that nostalgia is based on a longing for our lost youth (in the case of shopping, for a time when clothes fit us better) — but that doesn’t keep us from indulging in it. My own shopping nostalgia revolves around the department stores of my childhood. In the North Jersey suburbs where I grew up in the late 1950s and ’60s, we had Sears and Bamberger’s for everyday use, but for special occasions we went to New York City to the fashionable department stores. My mother, my sister, and I would put on our nicest outfits and take the train to Journal Square in Jersey City, then the Path to Manhattan, where we would visit Saks, Bloomingdales, B. Altman’s, and the other great consumer palaces. Each of these stores occupied an ornate edifice that took up a full city block, and each beckoned with elaborately decorated windows and plush interiors. Each had its own profile: Saks was elegant and understated; Bloomingdale’s, glitzy and fun; there was the matronly stateliness of Altman’s; and the brisk chic of Franklin Simon’s. 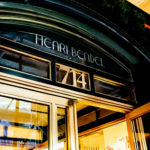 Bergdorf’s and Bonwit’s were so upscale and opulent as to be almost outside our ken — though we often strolled through and sometimes tried on a winter coat or a back-to-school dress in their hushed dressing rooms while skeptical salesladies looked on. We always stopped mid-way through the day for lunch in one of the department store dining rooms. These were brightly painted spaces with pretty banquettes and pastel tablecloths. The lunches had a sacramental quality. We ate our grilled cheese with careful good manners, sniffing the perfume around us, and watching the women, in their coordinated outfits, nibble on tuna fish sandwiches without crusts. Sometimes, we would get our haircuts at “Kenneth’s” at Saks. A haircut at Kenneth’s cost $20, an unheard-of price at the time, but necessary, according to my mother, to “get things growing in the right direction.” I still recall the scary ritual of being handed over to a sylph-like male creature (not Kenneth — he was off ministering to Elizabeth Taylor or Liza Minelli), who would survey me with studied contempt, then proceed to mold my unruly locks into one of those 1960s helmet styles. The style would remain in place precisely the length of time it took to take the train home to New Jersey, when it would relapse back into a frizzy mess. The department stores of my childhood were the site of female self-fashioning — a peek into the adult world where women wore red lipstick and white gloves, girdles, bras, and stiletto heels. I assumed I would one day enter this world when my hair would remain lacquered in place, even in gale winds. But by the late 1960s, things had begun to change. My sister and I like to recall the hippie boutiques that sprung up in our New Jersey town as we approached our teenage years. Our most vivid memories are of one store in particular: Focus One, which had a revolving mirrored ball hanging from the ceiling. Focus One was our Woodstock, though without the music, drugs, or bad weather. We can still spend hours linking pieces of clothing from that store to specific events: the fuzzy purple sweater coat (the Unitarian church hootenanny), the dirndl midi dress (the anti-war march on the town green), the turquoise paisley mini (the civil rights sit-in in front of the municipal building); and all the tie-dyed T-shirts and Indian print dresses (the dates with ponytailed boys spouting Buddhist philosophy). The clothes of this period marked our coming-of-age. They expressed a new idea of womanhood, a world more unfettered and unfocused than the one we had imagined during our visits to the department stores of our childhood. As it turned out, the late 1960s ushered in not just a new kind of womanhood but a new kind of consumer culture. Malls began to cover the landscape, decimating the town Main Streets and forcing the suburban department stores to relocate or close their doors. I remember one of the first to fold in our area: a small department store named Scott’s, where my mother bought her sheaths and shirtwaists, her pillbox hats and car coats — staples of the 1950s and ‘60s. The store had an elegant, muted atmosphere, and was presided over by elderly saleswomen who moved silently to and fro like priestesses. By the 1970s, this genteel store with its quaint merchandise had gone up in a puff of marijuana smoke. Even the big city department stores were obliged to change. Faced with more liberated shoppers and a new shopping climate, they lost their magisterial role and began to merge and mutate into watered-down versions of what they had been. They closed their restaurants and their hair salons, and, eventually, many gave up and went out of business. My mother-in-law, a great aficionado of department store culture, can rattle off, in a melancholy catechism, the great stores that are now defunct: Abraham & Strauss, Alexander’s, B. Altman’s, Blum’s, Bonwit Teller’s, Best’s, Klein’s, Ohrbach’s, Franklin Simon’s, Gimbels, Hahne’s, Hearns’, Mays, Wanamaker’s. The buildings that housed these stores have since become fancy office buildings or high-priced condos. Some have assumed more plebian use: B. Altman’s flagship store on 34th Street in Manhattan is an annex for the City University of New York. The Crystal Tea Room of Wanamaker’s in Philadelphia is now rented out for high school proms. The Bonwit Teller’s near where I grew up in North Jersey is now an LA Fitness Center, where you see people in spandex working out in front of the large glass windows. Department stores are still around, of course, but they don’t have the luster they once had. Boscov’s, Target, and Kohl’s are all workaday stores, unpretentious and well-priced — but almost interchangeable. Even those venerable stores that are still in business (Lord & Taylor, Neiman Marcus, Saks) are shadows of their former selves. On Fifth Avenue, where they once reigned supreme, they are flanked by tacky electronics shops and seedy discount chains. In the suburbs, they serve principally as structural supports for malls: “anchoring” them, in the language of mall consumerism, at one end or the other. 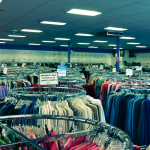 If I go to New York now, I visit thrift shops, not department stores, and if I go to the mall, I look in at the Gap if I need jeans, but don’t bother with the big stores. It takes too long to walk to their “anchor” position at the far end, and I’m sure to be depressed by their static interiors — racks of undistinguished, overpriced clothing, and lounging salesgirls, too busy gabbing on the phone with their boyfriends to pay attention to me. It’s like wandering into a mausoleum where a past cultural moment has been embalmed. Like all nostalgia, I know that mine has a strong reactionary underpinning. If there was a fantasy quality to shopping in the past, this is because it diverted middle-class women from the fact that they had little else to do. For those who had to work (and 35 percent of women in 1960 worked outside the home), it diverted them from the fact of lesser jobs at lesser pay. Shopping was an opiate for the female masses. 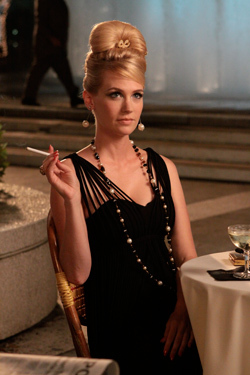 See the AMC series Mad Men for a good antidote to shopping nostalgia. All that cigarette smoking, daytime drinking, sexual harassment, and stultifying suburban conformity was the price paid for a great retail experience. Still, the waning of department store culture entails a loss of beauty. That bygone experience, no matter its gender oppressiveness or its health hazards, was an esthetic one. Not just the product counted, but the experience of buying it; not just the ends, but the means. Everything contributed — from the color-coordinated restaurants and swankily snooty hair salons to the changing rooms with triptych mirrors and upholstered armchairs. I can still whiff the inimitable mix of cigarette smoke and Chanel #5 that wafted through the aisles, still recall the comforts of fawning saleswomen, still hear the spike heels clicking down the polished aisles and see the long red fingernails tapping on the glass counters. Gone is the sense that going to a department store was a peek into a magical woman’s world.